Parents, Should You Tell Your Child to Stop Crying? Hearing kids cry can feel frustrating, but should you tell your child to stop crying? Turns out, you shouldn’t. Take a look at a few compelling reasons why. He scraped his knee and I held him in my arms, whispering, “Don’t cry, don’t cry…” Another time he’d been crying for 30 minutes straight and I snapped, “Stop crying already!” Maybe it was when I’d sent him to his room, telling him he can come out when he’s finished crying. It’s amazing how many times we tell our kids to “stop crying,” for many and even with good intentions—from comforting pain to losing our patience. Regardless of the reason, one thing is true: we want them to stop crying. We don’t want to see them in pain or hear more crying for another hour. And maybe we’ve just had it with their defiance and tantrums. Should you tell your child to stop crying? Crying isn’t the most pleasant of emotions. Except telling our kids to stop crying isn’t the best choice, however much we feel inclined to say it. No one wants to be told to stop crying, including children. Let’s imagine ourselves in their shoes for a minute. You had a terrible day. Maybe your boss embarrassed you in front of everyone, and dinner turned out to be a flop again. Not pleasant, right? But this is what it feels like when our kids hear us say those words. Their emotions are as real to them as yours are to you. And telling them to stop crying restricts their emotions. I’d love to have you around when you’re happy, but not when you have unpleasant feelings. Allowing your child to cry gives him the safe space he needs to sort through his feelings. Telling him to stop limits what he feels he can express. Read how you might be judging your child’s emotions. Convenience sometimes comes at a price. Telling your child—even getting angry at your child—to stop crying may just do the trick. Told often enough, or afraid enough, he’ll likely dwindle his tears to a few hiccups and sniffles. But he has missed out on several opportunities, including learning to manage his feelings. In holding him in your arms, you make it clear you’re here for him, no matter what. You also show him how to self soothe: taking deep breaths or holding onto a stuffed animal. Maybe you guide him to a quieter space, so that in the future he’ll learn how to calm himself down. And afterward, you can talk about what happened. He’ll learn that everyone feels sad and that it’s normal. That anger and frustration aren’t permanent but come and go. And that he can make them go away, such as doing something he likes or talking about it. He won’t learn any of this when we tell him to stop crying. Anyone who has ever told her child to stop crying knows how ineffective it is. It hardly works. I have yet to see any of my kids calmly stop crying after I told them to. And for good reason. They’re in the middle of some pretty rough feelings. They don’t feel comforted, especially if we yell at them to stop. And they have no sense of logic in this state—no amount of explaining will convince him to stop. You might as well save your breath because telling your child to stop crying hardly works. 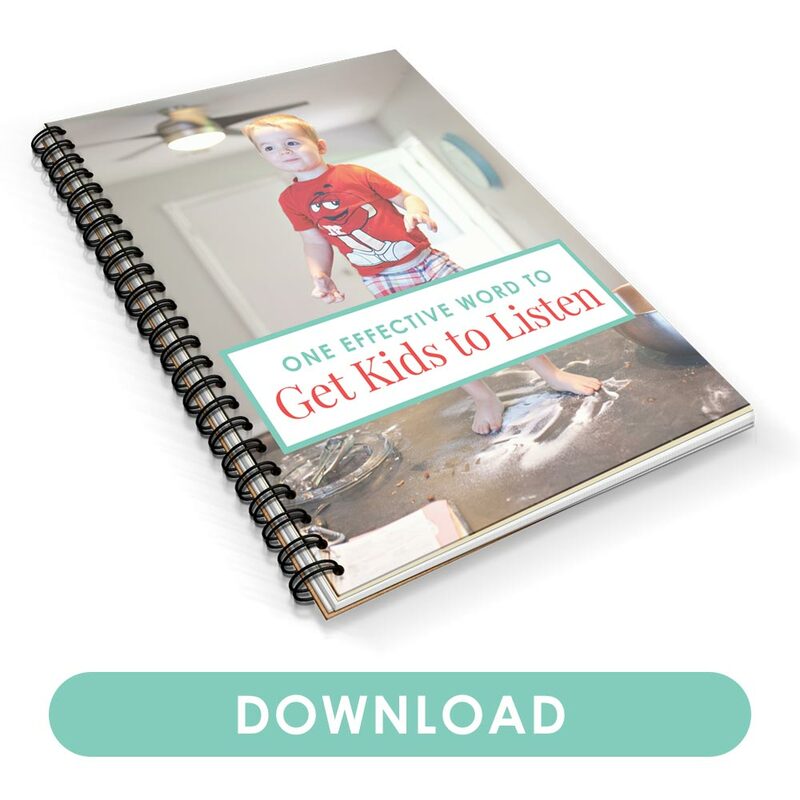 So far, we’ve learned that telling our kids to stop crying isn’t the most effective or ideal response. What to do instead? Offer a comfort item. My two-year-old knows to grab his lovey whenever he feels upset to soothe himself. Giving your child a comfort item can be a practical way to calm your child down. Give him space and time. Maybe your child isn’t in the mood to hug. Let him be. Don’t banish him to his room because he’s loud—that will make the situation worse. But do give him space and time to get it out of his system. Emotions don’t have time limits or need to be finished in five minutes. He won’t associate crying with attention (unless you only hold him when he’s misbehaving). Comforting him will, instead, decrease the amount of crying. My kids have melted in my arms and stopped crying versus the times when I told them to stop crying or got upset. Sometimes all they need is that hug, that reassurance that they’ll be all right. And crying is necessary. We all cry, and the younger and more limited our vocabularies are, the more tears we shed. Kids communicate and express their emotions through crying. It’s cathartic. Even adults feel better to cry than to bottle emotions. Whether to comfort or to discipline, telling your child to stop crying isn’t the way to go. Holding back tears restricts his emotions. He misses out on learning opportunities to manage his feelings. And it’s ineffective—rarely does a child stop crying when told to. Instead, allow your child to cry. Teach him ways to soothe himself. Reassure him that his feelings are normal. And, most importantly, show him you’ll be there for him. After all, the times we least feel like being with them is when they need us the most. 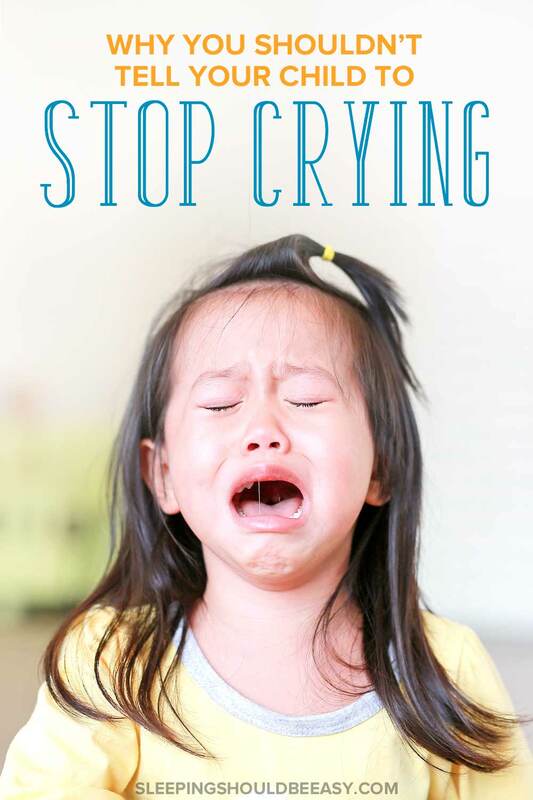 Tell me in the comments: Should you tell your child to stop crying? I’ve told my kids to stop crying countless of times, especially when the little one is faking it or when they’re crying because they’re being punished for misbehavior (like having a toy taken away). So, thanks for reminding me that it’s not a good idea because I certainly don’t want to hinder their emotions. Okay how bad is this: The same friggin’ day I published this post, I caught myself telling my two-year-old to stop crying. You are definitely not alone, Lisa 🙂 This is all a work in progress. Yep, crying is so hard to listen to! Absolutely, Raki. We forget how easy it is to simply be there for them. I have to admit. Even in my 30’s, if someone told me to stop crying, I’d be horrified. Sometimes you just need to let it out. Crying is effective and to be stopped is ineffective. I love your alternative ideas a lot better. Right, Tamara? I can’t imagine someone telling me even now to stop crying. I’d cry even more! No wonder our kids cry more when we tell them to stop crying haha. You always hear about those kids that cry about everything…and our middle child is definitely like that. I love my girls like no other, but L can find a way to sob big crocodile tears about the smallest thing. It’s her way to manage fear, anger, hurt, and sorrow. We never know if she’s going to want a hug or push us away, and she often can’t verbalize what she’s feeling…but don’t try to tell her what she’s feeling, she’ll just get angry. I suppose what I’m saying is that your statement “And they have no sense of logic in this state—no amount of explaining will convince him to stop.” is spot on for us with her. I never thought of it in those words. At some point I know she’ll be able to work through her emotions without the tears, but until then I suppose we just have to be there for her and help model ways to work through it once she’s calmed down. I know someone who was like that when she was a little girl too. It really is their way to cope and not something you’re doing to make her cry all the time. I think it’s good you know to not tell her what she’s feeling. I’ll usually advise parents to try to label their kids’ emotions, but clearly if it’s not working then you’re better off simply letting her be and supporting her. Great advice, as always, Nina! Hi Brett! Tantrums past the toddler stage is definitely a concern for many parents, especially if there’s a chance his friends might make fun of him. The good news is that I’ve found most kids don’t make fun of other kids for crying, even at that age. Sometimes we project our own fears onto our kids because we want to protect them from potential hurt and disappointment. It’s understandable, but often not necessary. That said, we should still help kids through their tantrums, because after a while, we want them to be equipped to handle big emotions without falling apart in tears. The first thing I would do is to actually acknowledge his feelings, even if it seems like it’s over the smallest or pettiest things. To us, it might feel insignificant, but to them, it feels just as real as the emotions we feel. Then, I would avoid belittling the emotions or the reasons he cried, but instead, relate to it. Next, I’d show him how to cope next time, whether it’s changing how he talks to himself (for instance, if he loses a toy, he can say to himself, “I’ve lost a toy before and found it, so there’s a good chance I’ll find this one again”), to simple exercises like breathing or finding a comfort item to hold onto. I found that addressing the feelings while giving them tools to cope is a great way to help older kids process their emotions in a healthy way, so that these tantrums decrease in frequency and intensity as he grows up. I hope that helps, Brett!